We’d love your help. Let us know what’s wrong with this preview of The Beth Book by Sarah Grand. To ask other readers questions about The Beth Book, please sign up. Sarah Grand was my choice for June in my Literary Birthday Challenge. Another new name for me, this author was born in Ireland to English parents in 1854. The Beth Book is described in the GR blurb as semi-autobiographical, and since I usually enjoy such books, I chose it out of the three titles available at Gutenberg. This story did indeed follow the broad outlines of Grand's own life, if Wiki is at all accurate about her. And it was not an easy life; it was not a happy story. I cringed through Sarah Grand was my choice for June in my Literary Birthday Challenge. Another new name for me, this author was born in Ireland to English parents in 1854. The Beth Book is described in the GR blurb as semi-autobiographical, and since I usually enjoy such books, I chose it out of the three titles available at Gutenberg. This story did indeed follow the broad outlines of Grand's own life, if Wiki is at all accurate about her. And it was not an easy life; it was not a happy story. I cringed through most of Beth's childhood, which was full of 'thumpings' and shakings as well as verbal abuse, simply because the parents did not understand the type of child Beth was, and tried to force her to behave the way she was expected to behave. She was overly sensitive, intelligent beyond her years even without any formal education, very observant, and with a temper that gave her both the spirit to endure her life and extra difficulties caused by no one but herself. In any era, she would have been a handful for the adults around her, but in those years she was considered a holy terror. It was a difficult book to read in many ways. The adult's treatment of Beth horrified me, but Beth's approach to life was also worrisome. She tended to live very much in a fantasy world (and who could blame her?!) but she often could not control the times she let herself escape, and would suddenly rejoin the real world by bumping into a light pole or a person, or discovering herself far from where she had intended to be during walks. I am honestly surprised that she managed to grow up at all, let alone grow up sane. I am not sure I would have the nerve to say that about a character who is supposed to represent me. Of course, I do not have Beth's spirit....Grand obviously did. There was an uncomfortable strident tone in many parts of the book. The author seemed to shift gears from relating Beth's life to ranting about the conditions of society that created it. Perfectly understandable, of course, considering how much the author had to relive in order to write this book, but there is explaining and there is ranting. Grand worked very hard in her adult years to try to change the world for women, and I am sure she needed to rant a lot. But I felt she got a little carried away in this book, and could have made her points with more subtlety. I had to skim the last chapters. I had seen our Beth through her childhood, which ended abruptly at about age 15 when she was married. I hung on while she dealt with the consequences of that decision, and followed her into Society and the discovery of people who saw her as Grand saw her ~~ a genius. But somehow by the last dozen or so of the 52 chapters, I just wanted it over. I wanted out of Beth's world. Kudos to Grand for re-creating that world, I am sure it was a painful experience to have to look back in such detail. I wish she could have been born in modern days. She might have had more joy in her life. Usually I want to read other titles by my Literary Birthday authors, but I honestly don't know if I want to read any more of Grand's work. I will have a peek at them Someday, but if they are as painful as this book was, I'll pass. I love this book - the depiction alone of Uncle James ('Jimmy-Wimmy') and the description of the dreadfulness of a male nag is priceless! It's very in keeping with the writing of that era, a story of a girl growing up and finally reaching an independent state after living under male....constriction. The author eventually became the first Lady Mayoress (of Bath) in her own right in Britain and the story is probably strongly autobiographical, though it is not an autobiography. In my Top Twenty - pr I love this book - the depiction alone of Uncle James ('Jimmy-Wimmy') and the description of the dreadfulness of a male nag is priceless! It's very in keeping with the writing of that era, a story of a girl growing up and finally reaching an independent state after living under male....constriction. I recommend it! Surprisingly funny. There's a little bit of that Victorian style, but just enough of the modern style that it makes it an interesting read for the contemporary reader. Plays with gender roles in an interesting way for the time period, too, of course (reading it for a gender and lit class). Also, I really related to the main character, and I think anyone who remembers their childhood well will. I'm a total Anglophile, (including Scotland and Ireland) and this is another beautifully written portrait of a young woman. To quote the story itself, this book has done me good. I enjoyed The Beth Book more than any other book I've read in a long time. It was a fairly large book, & I took my time reading it, wanting to enjoy every page. I found this book, by chance, in a used book store. It had fallen, or had been placed behind the books on a shelf. I am amazed that I never heard of the author, Sarah Grand. This would have been a perfect book to have been read by high school or college girls, as it discusses women's rights quite a lot. I had to double check the date I enjoyed The Beth Book more than any other book I've read in a long time. It was a fairly large book, & I took my time reading it, wanting to enjoy every page. I found this book, by chance, in a used book store. It had fallen, or had been placed behind the books on a shelf. I am amazed that I never heard of the author, Sarah Grand. This would have been a perfect book to have been read by high school or college girls, as it discusses women's rights quite a lot. I had to double check the date of publishing, as the book seemed more modern, at times. The book also seems to mirror the life of the author; possibly, it is semi-autobiographical. The story is about a little girl named Beth, of course. We start when she is quite young, & the story follows her life until she is 25. She is an amazing child, very outspoken, & maybe a little odd, to some. She is so in tune with nature, & she has such a gift for words. She is an independent little girl, & this, of course, causes a lot of problems, especially as she gets older. Women had very little in the way of rights back then. Education was for boys, & Beth is always told she can't do something, that she's too "silly, idiotic," or "just a girl." She is a very sensitive girl, & the constant belittling does affect her self-worth. But there are those who support her, too, so she is not completely demoralized. There is also humor in the story. Beth says some amusing things, & she is quite brave, too, whether an opponent be man or force of nature. The author does not merely tell a story. She also advocates for women's rights, as well. Ms. Grand writes a story, while, at the same time, produces a book that gives the reader something to think about, to discuss with others, with the hopes of improving society, humanity. I can imagine how true that must have been when this book first was published. The Book of Beth is a marvelous story of a young girl, with tremendous spirit. who thinks of others before herself most of the time. It's not enough for her to fight for herself, but she is called to be there for others. I had to read this book for a college course titled "New Women Novels" and honestly I would have never tried reading this otherwise. It's not that I do not like reading Victorian novels; I can deal very well with their plot-less-ness and mostly one-dimensional character sketches, but The Beth Book was quite tiring. The one thing it absolutely needed was a merciless editing. The only parts I really liked were from Beth's childhood and adolescence. She is a spirited heroine, but not in the practi I had to read this book for a college course titled "New Women Novels" and honestly I would have never tried reading this otherwise. It's not that I do not like reading Victorian novels; I can deal very well with their plot-less-ness and mostly one-dimensional character sketches, but The Beth Book was quite tiring. The one thing it absolutely needed was a merciless editing. The only parts I really liked were from Beth's childhood and adolescence. She is a spirited heroine, but not in the practical, matter-of-fact manner of Elizabeth Bennett or such. 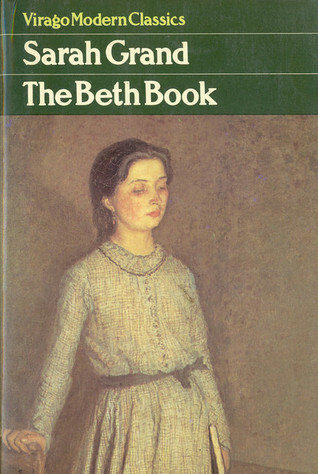 Beth does not understand the ways of the world and conjures up worlds of imaginations of own her which makes her funny and interesting; such as, when she pretends successfully to be possessing supernatural powers and to be able to curse animals to death, she is attempted to be shot by a silver bullet; or when she pretends to be a secret agent and makes an elaborate theatrical performance with a hired horse and borrowed pastries to prove its veracity to her friend; or when she disguises herself as a boy and goes to a circus with two boys; or takes revenge on her sister by leaving her hanging on the corner of the roof. Read this a million years ago and somehow it just came to mind. Very much enjoyed these Virago Press books in the 1970s and '80s.